The MBA program at the David Nazarian College of Business and Economics at California State University, Northridge has been ranked among the top 150 part-time programs in the country in U.S. News & World Report’s 2017 list of the best graduate schools. The U.S. News & World Report 2017 Best Graduate Schools rankings recently came out. U.S. News & World Report ranked CSUN’s Nazarian MBA program among the top part-time MBA programs in the country. Photo by Lee Choo. 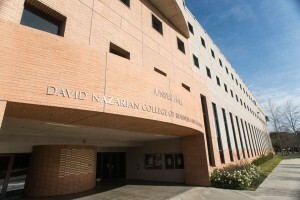 “The Association to Advance Collegiate Schools of Business’ (AACSB) accreditation of CSUN Nazarian College, the fact that the college is a Princeton Review 2016 ‘Best Business School’ and our MBA program’s ranking in U.S. News & World Report serve to validate the rigor and reputation of our programs,” said marketing professor Deborah Heisley, director of graduate programs in CSUN’s Nazarian College. To be eligible for the part-time ranking, a program needs to be offered by an AACSB-accredited institution and to have had at least 20 students enrolled part time in the fall of 2015. The rankings are based on five factors: average peer-assessment score gathered from business school deans and other MBA program directors; average GMAT and GRE scores of part-time MBA students entering in fall of 2015; average undergraduate GPA; work experience; and the percentage of fall 2015 MBA enrollment that is part time. In CSUN’s Nazarian MBA program, mid-career professionals incorporate rigorous academic training into their business experience in order to elevate their careers, switch careers or become entrepreneurs. Nazarian MBA students gain and integrate functional business knowledge in disciplines such as finance, strategy, general management, business analytics, marketing and entrepreneurship. They improve their analytical and decision making capabilities; their teamwork, leadership and communication skills; and their ability to successfully operate in a global environment with multicultural awareness. They also learn to apply ethical, legal and socially responsible frameworks in organizational and business contexts. Students balance family, work and school in this flexible, part-time program. Classes are held Monday through Thursday from 7 to 10 p.m. so that students do not have to leave work early. The program’s faculty — handpicked for a balance of excellent teaching, research and business practice credentials — facilitate active learning in small classes. Nazarian MBA students join a diverse group of accomplished professionals who live and work in the Los Angeles and Ventura counties. They expand their network dramatically as they attend classes, speaker events, workshops, and student and alumni mixers with peers, faculty and organizational and business leaders. The program is enhanced with an active entrepreneurship program that partners with LACI@CSUN, the on-campus clean tech incubator. At the end of the program, students conduct a consulting project for a local organization under the supervision of faculty in an integrative learning experience.